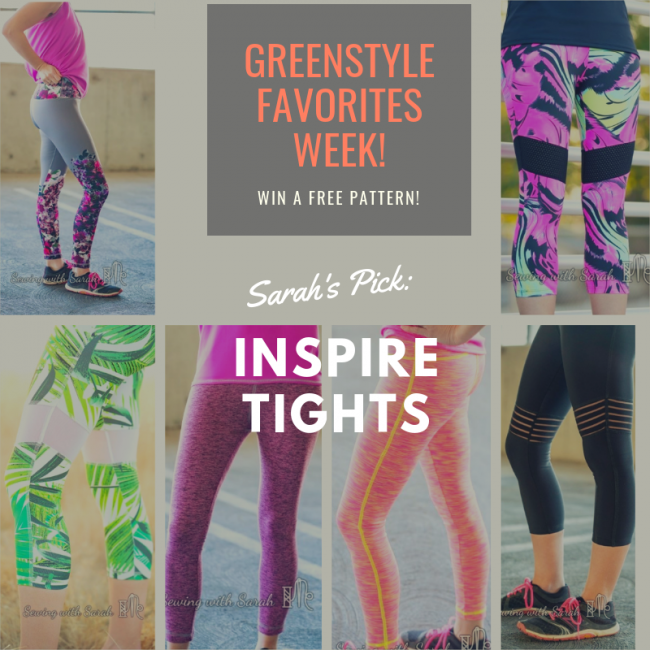 It’s not exactly a secret that I’m a big fan of Greenstyle patterns, and today I’m kicking off the Greenstyle Favorites Week by sharing my favorite Greenstyle pattern– the Inspire Tights! Before I get started on my Inspire-rant, here’s a brief description of the pattern in a nutshell: The Inspires are a classic leggings pattern, designed for athletic wear, with negative ease for a tight fit, a contoured waistband, a triangle gusset, and options for adding inserts behind the knees, or an angled on the upper leg. They have a side seam, which can be emphasized with contrast cover stitching, or eliminated for a seamless look, and, most importantly, a fit blows everything else I’ve tried out of the water! Greenstyle has several very well loved leggings patterns (and I’ve made them all! ), so why are the Inspires my favorite? One word = VERSATILITY! When I get dressed in the morning, I might have a vague outline for my day- but despite my love for color-coded schedules and all things structured, #momlife and homeschooling has taught me that the only way to “fit it all in” is to be imminently flexible. One day I might get up early to squeeze in a workout- another I might grab my me-time on the fly at the park while the kids are at an activity, and the next day I might not be able to get my run in until the end of the day, after the kids are in bed (thank goodness for home exercise equipment!). Whenever my me-time does roll around, I want to be ready, so dressing in athletic wear is the best way to ensure that I actually do get to work out when the opportunity arises. I also love that the Inspire tights make great everyday leggings for that night out with the girls, or under a tunic for work (I do work at a college, so there’s a more relaxed dress code- yay! )- pretty much whatever I’ve got going on, the Inspires have got me covered in comfort. With the addition of a back zipper pocket (check out the hack tutorial here), I’ve even got a place to stash my credit card and key for those times when I don’t need my huge #mompurse (ya know, the one with a diaper, 3 lipglosses, a McDonalds toy, and 500 pennies rolling around the bottom). There’s even an easy hack for a no-side seam view- perfect for those prints that you don’t want to cut up/match. I did a SewAlong for the Inspires a couple weeks ago- you can find all the video tutorials HERE on the blog, and get a closer look at the construction of this awesome pattern. If you’re curious about how the Inspires compare to the other leggings patterns, you might want to check out THIS post that I wrote on the Greenstyle blog- all four of the leggings patterns are winners, but the Inspires are just my go-to gal! Since I love the Inspires so much, I even whipped up another pair in some fantastic fabric to share with you….but unfortunately, I live very near the Camp Fire, which has decimated the homes of many of our friends, and remains a threat to our town. The air quality is unsafe, and therefore I wasn’t able to get photos for you…yet! If you have a spare moment, any prayers for the communities affected by this tragedy would be appreciated- so many people lost everything, and I feel very grateful to be safe as I write this, and look forward to being able to continue sewing and sharing when the situation improves. On an more upbeat note, if I’ve convinced you to snap up the Inspires, you can grab them on SALE today here for 40% off, no code needed. If you’re feeling lucky, you can also enter to win a FREE copy by leaving a comment below! While you’re at it, I’d love it if you took the time to give my blog a follow so we can connect! Note: This post contains affiliate links- thank you for your support! I love all the info you provide in your posts and can’t wait to try these too! I love all your versions! I have the strides and the super G’s…do I really need a 3rd pattern? Probably not but you are a great saleswoman! I’m definitely buying a pair! I’ve been looking at a bunch of patterns and I haven’t been able to commit until now. I’m so glad- self care is really important! I don’t have a serger (yet!!) but might have to give these a try anyways. Your tutorials look super helpful!! You can definately do them with a standard machine! You post comparing all the leggings has been so helpful thank you! I love these! Thank you for taking the time to go into detail about them, I think I may need this pattern! Love them all. Great job. I’m excited, I have the others too but a girl can always use another style. 🙂 Thanks for the opportunity. These look amazing! I love the bright stitching to give them an extra kick. I will have to say the green and white leaves ones are my favorite. Its unlike anything you can get in a store but they look extremely professional. Am I daring enough to try a pair myself? I love following your blog and sew a longs. I just took up Pickleball so I need to make more leggings. I love tights and this pattern looks amazing! My athletic wear is in desperate need of an overhaul. Great timing! I love reading your blogs! I haven’t tried these yet, but I’m definitely going to get the pattern. Thank you for this post and ll the greaat hacks you mention. I would love to win this pattern. You have recently inspired me to get a peloten, and now the inspires are the only leggings from greenstyle I don’t have, so I guess it’s another inspire! Haha I have one of the above photos saved to Pinterest, so I’ve clearly been waiting to make these for a while. Love your blog! These are really cute, I definitely need to give them a try! These are amazing, and I love all the hacks! Beautiful! You inspire so many of my makes! I appreciate your thoroughness and willingness to share tips. ❤️❤️ I can’t wait to try this pattern, too. What a beautiful compliment, thank you! You’re such a doll! Thank you for all the work you do with the GS team. Oftentimes you share the perfect piece of information that tips the balance and lets me purchase a pattern guilt free! Ooooo I need to try a great leggings pattern. Greenstyle patterns are all so amazing. I have so many top patterns, but I only have one of the pants patterns. They are fantastic! I’ve been wanting these! So cute! The pair made of the matte palm print with white inserts is so pretty! Of course they are all super cute! No wonder they’re a favorite! Love all your hacks and blog posts. They are so helpful. Prayers for your friends near the fire and for safety. 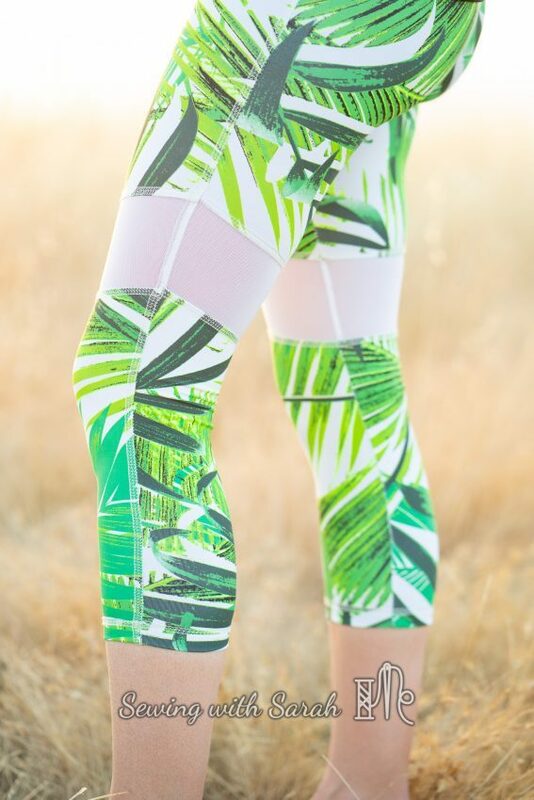 The matte palm print with white powernet pair are so cute! Of course they are all super cute, no wonder they are a favorite! I love all of your versions! I too asore the versatility of GS patterns – these options for color blocking are super awesome! Thanks for sharing! Oh man, now I have to get these. So many beautiful Inspires- I think my Granddaughters would like this pattern! Stay safe- must be scary for all of you- hope your children are handling this alright- must be difficult as a parent – keeping you in my prayers! I love and learn so much from your blog, Sarah, thanks for sharing! I’m trying those Super-G’s that I messed up a few weeks ago! I found my error and am ready to try again! Thank you for the blog, prayers and thoughts are with you…I hope they get the fire contained and out soon. I love all of the amazing options and can’t wait to sew it up! I have the Super G’s and Strides–after hearing your love for the Inspires I may just have to add these to my collection! I hope your family, friends, and loved ones all stay safe from the fires!!! I finally started wearing leggings, but they usually for for crap across my back or cost a fortune. Would be fun to put these to the test. RedCross.org for those wanting to help wildfire relief. Stay safe! I love your blog and video tutorials. I am inspired to make my own leggings and think I’ll take advantage of the sale today. Thank you! So cute… Now I need to decide inspire or super g or both?? They are so pretty, yet functional! I love that waistband pocket hack! All your makes are amazing! Thank you- I love having a place to stash my phone where it can’t fall out! Always love seeing your creations and reading your blog. Just followed your blog. I love all your hacks. Thanks! Yay- thank you so much! These look great! ❤️ Love this week of favorites idea! I’m curious if the pattern goes to the ankle and if it is fitted for the calf. I couldn’t find a line drawing. Love the hacks! Its very fitted all over, and yes, there is a cropped cut line, which would end just above the ankle, or a longer cut line if you prefer. Thank you for your compliment! I love how you were able to make shi many different looking leggings from just one pattern. That’s very cool. Wow, that’s a lot of Inspires! I love all of them! Perfect! This is my first visit to your blog.. love it! I’m so glad you found it! Thank you for visiting! I have had this pattern forever and never made it. I have no idea why. Thanks for the inspiration! I love these! You have shown so many options! I love the gray & floral ones! Great give away and can’t wait to try this pattern! I’d love a copy please. I would love to make this and a free copy would be great. I hope the fires are out soon! Thank you for offering the giveaway in the midst of being uprooted from your home also. I have a question about the rise…where does mid-rise hit on the waist? Is it above or below or right at the belly button? Thanks again! The rise on the Inspires are mid rise (about an inch or two below your BB) but I always swap the WB out for the stride waistband, which is high rise (just on my BB), which I prefer. Great pattern would love to make these! Are they a good one for first timer using stretchy fabric? I think they would be GREAT for a first timer! Just make sure your fabric has the appropriate amount of stretch. I really need to buy this pattern and try it out, it has so many great options! I am just getting started making leggings. Greenstyle has been the best patterns I have found so far. Think I’m going to have to go buy me another pattern! I didn’t know there were so many hacks! Thank you so much for the compliment about the blog! What fabric are you using? that can make a big difference as well. Thanks for sharing all your tips on making these. They’re definitely on my to-do list, especially after reading how comfortable they are for everyday wear. I work from home some days and need to find some comfortable things to wear that still look stylish if I pop out to the shops. Oh, yes, I live in these, and they are especially great if you don’t need to wear office clothes! Inspire-ing blog! Love all the hacks you shared. Prayers for you and everyone affected by the Camp Fire! You’ve inspired me to try the pattern!! I love all of these! You give great details that anyone can do it! I love these! I may have to add them to my wish list of patterns. Stay safe! They look very cute, I love your top stitching. All your pairs are so cute! I’m mega-short and really should start making my own. How difficult is it to adjust the pattern to make these shorter… like A LOT shorter (think 25ish inch inseam for full length)? Not hard at all! I would start with taking a couple inches off the crop length, in a couple places on the leg. I love these. My daughter lives in leggings. I need to jump in and try these for here. Where do you get all of your amazing fabric for them? I like supplex, or athletic brushed poly. Fabric Fairy, Zenith and Quasar, So Sew English, etc all have great options. Love the versions with the see thru mesh and a back pocket hack?! Mind blown! I love mesh inserts- they just make me feel like one of the cool kids! Love all of your positive support for us inquiring newbies! Stay safe! I’ve been thinking about a side seam leggings pattern, so I’m happy to hear you can make these without the insert! oh, yes they make a great basic! I haven’t tried any of the athletic leggings yet! Yours look great! Thank you for the giveaway! I haven’t dipped my toes into sewing activewear yet, but I dance 4 or more nights a week and I really need some new leggings to get me through! This pattern looks super versatile for making a whole wardrobe of different legging styles!! oh wow- sounds like you really need some leggings! The Inspires would be a great place to start! I am inspired with all of your Inspires! And rating for you and your friends and neighbours who are having to deal with these horrible fires. Haha- Sorry about that! I do think its good to have options! You do beautiful work!! Keep inspire-ing (HAHA!) us!! LOVE your sense of humor- just like mine! I really like the look of Strides, but I’ll go check your other post to see which one I should tackle first! I have always wanted this pattern, you have convinced me! Nice work, they all look so fab! This is the one legging pattern I do not have. I think I may need it now. LOVE! I think you may have convinced me to give these a try as I need some new workout leggings.